Update: BlackBerry has now released its Android 6 Marshmallow update for the Priv and it comes with a selection of new BB specific features as well as the tweaks Google provides. You can download the update right now. Well this is a turn-up for the books. 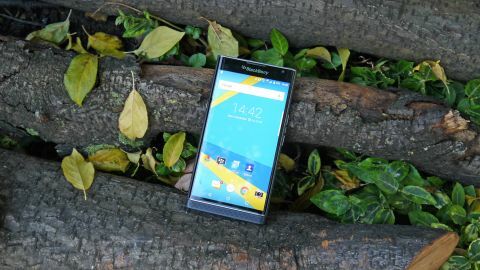 After almost four years of banging the BlackBerry 10 drum it seems the Canadian firm has finally admitted defeat, launching its first Android smartphone in the BlackBerry Priv. It's not entirely a surprise – the Priv was rumored for months under the codename Venice, and a move to the Android platform makes sense. BlackBerry 10 suffered from a severe lack of top-flight applications, and an interface which wasn't quite as intuitive for the general public as the now familiar Android and iOS. That's all been addressed, with the BlackBerry Priv sporting Google's stock Android platform, and with it access to the app-packed Play Store. In fact, it recently received an update to Android 6.0.1 Marshmallow, which brought with it a number of further tweaks and improvements. Coupled with a tasty sounding display, some handy BB apps and BlackBerry's legendary keyboard the Priv is finally helping the Canadian firm to make some positive strides in the market. But is it all a little too late again from the firm that was left behind by the original smartphone revolution? BlackBerry is evidently convinced that it's done a good thing with its decision to switch to a new OS, as it's planning three more Android-powered handsets for 2016. The BlackBerry Priv's 5.4-inch QHD display, Snapdragon 808 processor, 3GB of RAM, 32GB of internal storage and 18MP rear camera means it stands up against the flagship competition of 2015 – the problem is, it arrived around six months later, and 2016 has seen a new batch of pumped-up competitors like the Samsung Galaxy S7 Edge and the HTC 10. One thing the Priv has on its side compared to those newer models is price. If you shop around, you can pick one up SIM-free for around £450 in the UK (roughly AU$779), or for around $400 in the US. It's the same benefit/curse of every Android flagship more than three months old, but it's still a bonus. Of course there's another related problem here, in that the Priv's contemporaries have also dropped in price since launch - in many cases by a good deal more. You can pick up a brand new Samsung Galaxy S6 Edge, HTC One M9, LG G4, Nexus 6P or Sony Xperia Z3+ for less than the Priv – and these remain some of the best phones in the world, irrespective of the fact that most have since been superseded. The BlackBerry Priv has its work cut out then, if it's going to convince people to part with more cash and shun the established names in the Android market. The 'Priv' name stands for Privacy, but on the box it also says Privilege, so things are a little confusing from the outset. But it's not all bad news, as BlackBerry has managed to make a surprisingly good handset. The BlackBerry Priv is a smartphone I've been genuinely excited to see, as it brings something different to the Android market, and I was pretty content when I got it in my hands. It's been years since I had a slider phone – I loved my Nokia N95 – and the satisfying sound and action as you pop open and close the BlackBerry Priv will no doubt transport you back to the early noughties, when slider phones were big business. There's a slight metal ridge towards the bottom of the Priv, between the screen glass and front-facing speaker, enabling you to get your thumb under and push the handset up to reveal the keyboard. Push the screen two-thirds of the way up the keyboard and the Priv will complete the sliding pop action for you. I found myself idly playing with the slider throughout the day – there's something comforting about flicking the Priv open and closed. Satisfying slide action aside, the BlackBerry Priv isn't exactly small, and nor is it lightweight. At 147 x 77.2 x 9.4mm the Priv is sizeable in the hand, although not completely dominating. I was able to hold it one-handed and perform basic tasks, but for intensive periods of writing you'll want to hold on with both mitts, especially when you consider that the Priv tips the scales at 192g. Just to place that in context, the Nexus 6, which many have derided for its excessive bulk, weighs 'just' 184g. Flip the phone's display up to reveal the keyboard and the height extends to 184mm, which feels very top-heavy when you're tapping away on the keys – but more on that in the next section. BlackBerry has followed in Samsung's footsteps when it comes to the screen, as the Priv sports dual-curved sides just like the Galaxy S7 Edge and Galaxy S6 Edge before it. The edges aren't quite as pronounced as Samsung's implementation, but it still generates an eye-catching effect which draws the eye in. The glass front surrounded by a metal rim, which is raised at the top and bottom to protect the screen when it's face-down, makes the Priv appear suitably premium. Pick it up, though, and the illusion is somewhat shattered. BlackBerry has clad the back and sides of the Priv in what it calls a tensile weave, which basically means it's not metal or glass, but what feels like rubbery plastic. It's the same finish as found on the Q10 and Z30, and while it does have a nicer finish than the plastic Samsung used to insist on splashing on its flagships it's certainly no match for the elegance of the iPhone 6S, One M9 or Galaxy S6. The plus side here is that the material is extremely grippy, and the rounded edges of the BlackBerry Priv means it can be held securely in hand. I found the plastic covering to be a little creaky in places too, and applying just a small amount of pressure on the side below the power/lock key generated a squeaking noise from my launch handset. The second handset we got in for testing further down the line doesn't have this issue, however, so it may just have been a one-off or an issue with the initial batch. The rear of the Priv is dominated by a sizeable, protruding Schneider Kreuznach camera sensor, with a dual-LED flash to its side. These, plus the iconic BlackBerry logo, are the only features on the flat rear of the handset. On top you'll find trays for the nanoSIM and microSD card, while on the base a centralized microUSB port resides next to a headphone jack. All in all, the BlackBerry Priv is a bit of a mixed bag when it comes to design. I love the slider action and the dual-curved display, but it's let down by a weighty construction and creaky plastic.